Same as the MNSOB3R-2P except this is good for 75 amps per pole. The MNSOB3R-2P's red handled is LOCKABLE IN THE OFF POSITION! Description: MNSOB3R-2P is a disconnect switch. 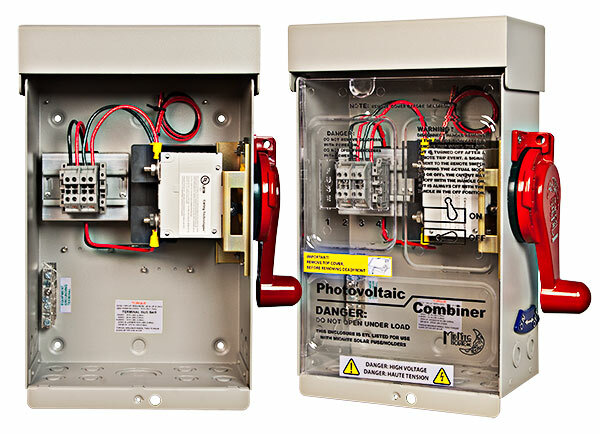 It has a 2 channel switch that breaks both the positive and negative of a PV string to a Transformer-less inverter. It has a combined rating of 600v and 20 amps as shipped. The switch is good for 100amps but the wire and terminal blocks limit it to 20 amps.